Flights & Irons Urban Kitchen is a concept centered on cast iron. Employed in the cooking and service of its meals are pans, kettles and even casserole dishes made of the thermally efficient material. It keeps the food ripping hot and the nostalgia high. More than anything, it’s intended to convey the message that this restaurant is a rustic, back-to-basics kind of a place. It also helps that a wood fire crackles and pops inside the oven in which almost all of the restaurant’s cuisine is baked, roasted and seared. The concept reminds me a lot of Noah von Blöm’s Arc Restaurant in Costa Mesa. Von Blöm has become famous for consciously shunning modern cooking methods in favor of the primitive. But the chef at Flights & Irons doesn’t strike me as another Luddite; he just seems to embrace cast-iron cooking because it makes sense for a majority of his dishes. Take, for instance, his chili and cornbread, which come as a set. 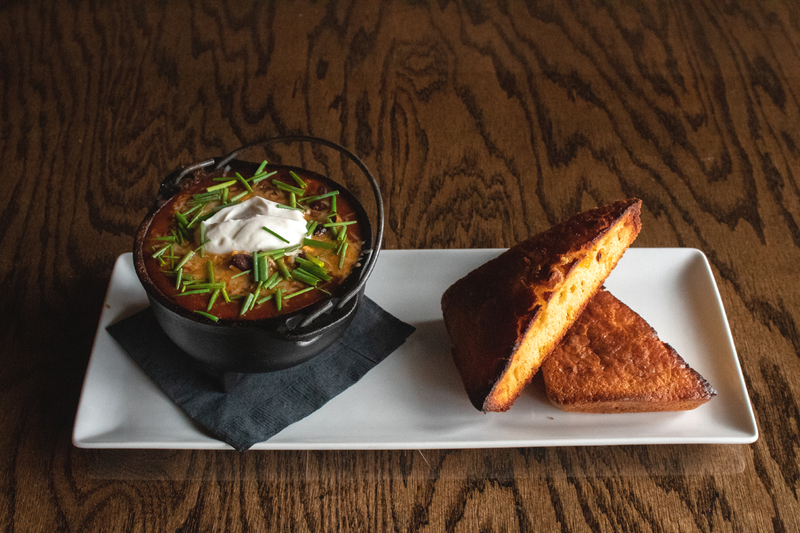 The chili is served in a cereal-bowl-sized kettle, and the cornbread still has the shape of the square cast-iron dish in which it was baked. Though I don’t think the chili was cooked individually in a single-serving pot, it still benefits from being ladled and served in it. The heat melts the cheese and keeps everything at a temperature just below a low simmer. There were at least two kinds of beans used, and it has an overall taste that doesn’t stray far from Hormel. But ordering and eating the chili here just felt right. As I dipped the crusty, caramelized corners of the cornbread into the stew, I imagined the campfire-cookout scene from Blazing Saddles, but with less flatulence. Although not everything is served in cast iron, the appetizers are called “Little Irons,” while the mains are “Big Irons.” In between, there are salads, sandwiches and soups. The soups include the aforementioned chili, a French onion, and a tomato with coconut milk my waitress recommended ordering only if I was also going for the grilled cheese. By far the most popular appetizer is the bourbon bacon meatballs, which arrive on a square cast-iron dish. The second most popular app is the fried green tomatoes, which does not. 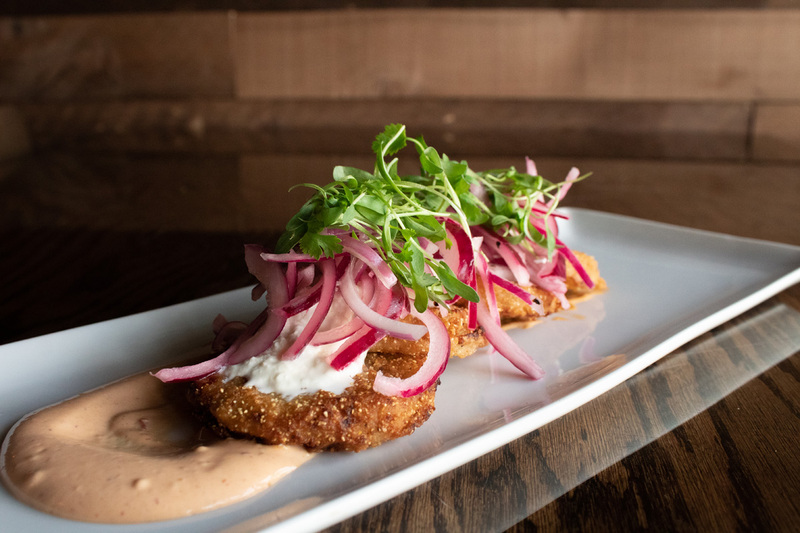 Rather, the sliced and cornmeal-breaded tomatoes are fried in an unseen cast-iron skillet, then layered on a normal plate with a creamy chipotle sauce and dollops of burrata, then garnished with a bit too much pickled onion and micro cilantro. It didn’t much matter it wasn’t served on a skillet, nor would it have made much sense given the cold mayo-like accompaniment. Also, the tomatoes are still crisp and hot, and they go down so fast that they’re gone in a blink. 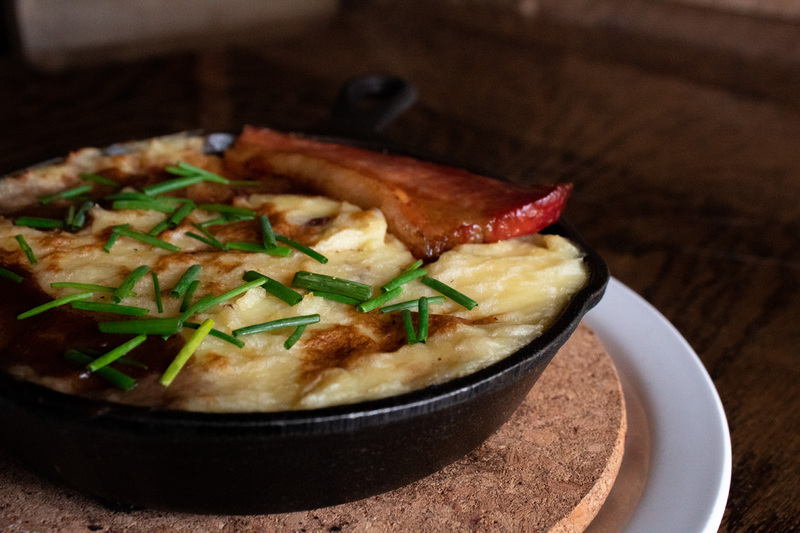 For a main course, you could get an “iron-seared” rib-eye or an “iron-roasted” chicken, but you’d be missing the point if you didn’t order the shepherd’s pie. It’s not only the cheapest main entrée, but it’s also the culmination of Flights & Irons’ entire mission statement. More important, it’s just good—the literal incarnation of a classic meat-and-potatoes combo. The top layer consists of mashed potatoes so creamy they would be soup if they were any creamier. The bottom is a silky stew made from soft cubes of filet mignon, cabernet, onions, celery and carrots. When you scoop into the dish, you discover both layers have melded together so well you can’t tell where one ends and the other begins. And it’s so scalding hot you have to blow on it for a good minute. Just in case, your waitress will tell you to “be careful, it’s hot.” In fact, if you order anything that’s served on cast iron, she’ll remind you and warn you every time. It’s out of genuine concern that you might forget and also probably because she’s seen people who have. After all, the first part of the restaurant’s name means the place is basically a bar. Half the place resembles a cowboy saloon, and the other half a quaint village inn. 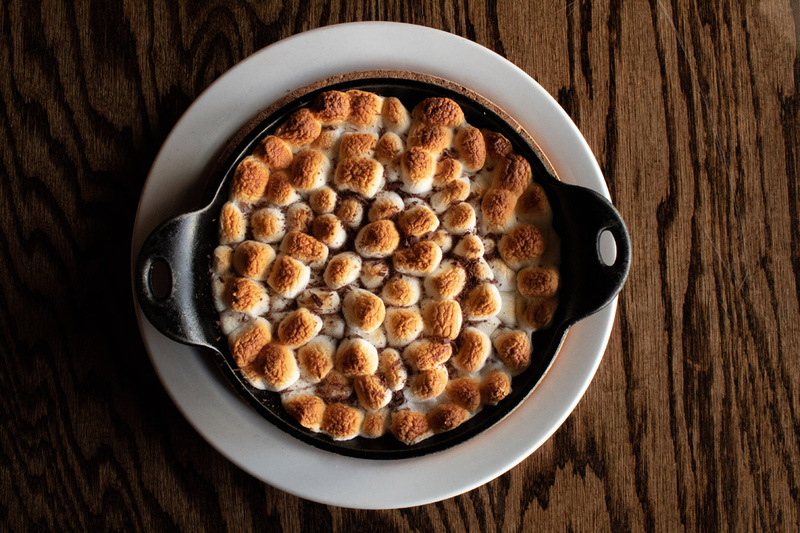 Heed all of her warnings, but also this one about the s’mores dessert skillet: The first bite will be thrilling. The toasted marshmallows stretching in webs; the dark-chocolate chips melting; the cookie dough reminding you of BJ’s Pizookie¨. But then the sweetness quickly becomes overwhelming. And because of the huge portion sizes of the meal you ate up to this point, the prospect of finishing the entire thing seems impossible. The good news is you can take it home. And there’s absolutely no need for another heated cast-iron pan to enjoy the leftover s’mores—just a cold glass of milk. Flights & Irons Urban Kitchen, 376 Camino De Estrella, San Clemente, (949) 388-3991; flightsandirons.com. Open Tues.-Thurs., 11 a.m.-11 p.m.; Fri.-Sat., 11 a.m.-11:45 p.m.; Sun., 11 a.m.-10 p.m. Appetizers, $10-$13; Entrées, $23-$36. Beer and wine.